Have you ever looked at a seed? I mean, moved close to it and really studied that little pod of impending life? There it is, completely contained in its safe shell, perfectly shaped and easily hidden out of view. It could remain there, safely tucked in its protective sheath, never changing from its current state. It might even be happy there in the only world it knows, but what if it dares to try for more? First, it must crack and split apart in what would appear to be a violent burst of energy forthcoming. Then the interior twists and spits itself out of the formerly contained sheath, spilling out to the open where it is exposed to the elements. It is broken, mangled, and nearly unrecognizable. On the minuscule scale of a seed, the undoing is complete and utter chaos as a tiny tendril of life reaches beyond the world it knew, from inside its former place of comfort and protection. survival. With the right conditions, it grows and twists and climbs toward the sunlight, gaining strength in its new life every moment. Before long, it changes from having the characteristics of a seedling to taking on the elements of its destined form. Perhaps it is a flower or a shrub or a tree, but whatever it seeks to be, it will become. Yet, when it develops into its fullest potential, glorious and beautiful it is new-found state, it will wonder why it ever considered remaining quietly in its contained shell. The thoughts of the seed bubbled up in me this week as I experienced a bit of undoing as I learned a new series of tasks at work. The subject matter is interesting to me but extremely unfamiliar. That unfamiliarity brings inevitable mistakes as I learn the steps. Luckily, I have a patient teacher who instructs, reviews, guides, and encourages me to try again. As one who detests making mistakes, I am likely more hard on myself than anyone else, and I have to return to the story of a seed to remind me how all growth is preceded by chaos. I cannot get from here to there without going through the messy parts of growth. Eventually, that chaos will subside as the growth of knowledge takes root. Until then, it may look pretty messy. I stood on my back porch this week, watching, what I hope to be, the last snowfall of the season. The flakes were big and fluffy and floated slowly downward. Before long, the Bradford pear tree in the corner of my yard was coated in a white layer, its full rounded shape making a beautiful silhouette on the evening sky. A smile came across my face as I remembered how it did not always look that lovely. several days while we had no electricity. -- and that's without a heat source! 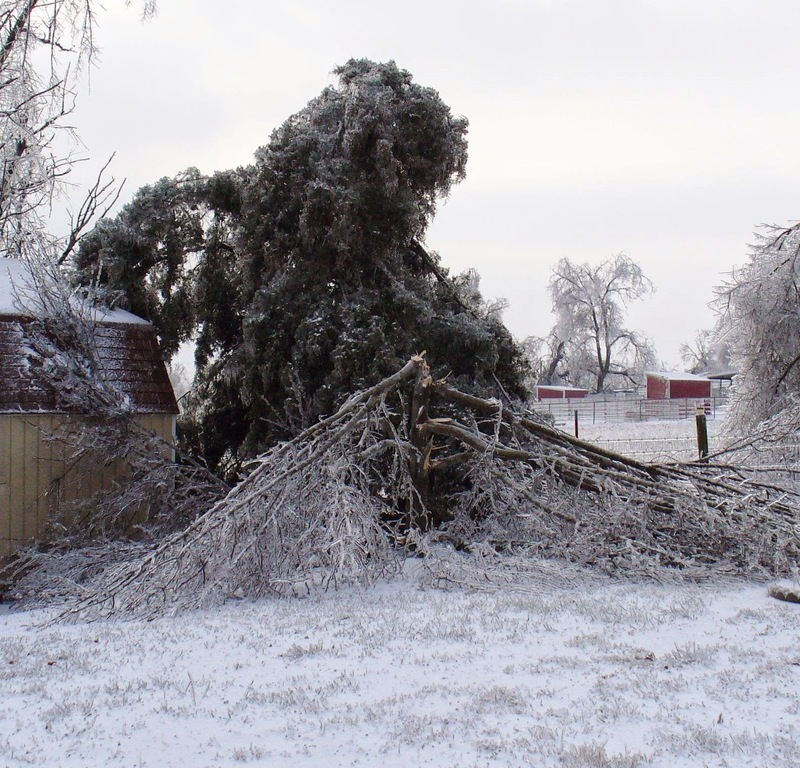 In 2009, we experienced a terrible ice storm. The freezing rain began in the afternoon and coated power lines and trees with a heavy layer of ice. I lay in bed that night and listened as tree branches snapped outside, sounding like the breaking bones of some of my dear friends. It was painful to hear, and when the power lines snapped a bit later, the absence of the underlying hum of electricity in the house made the sounds of the storm that much clearer. 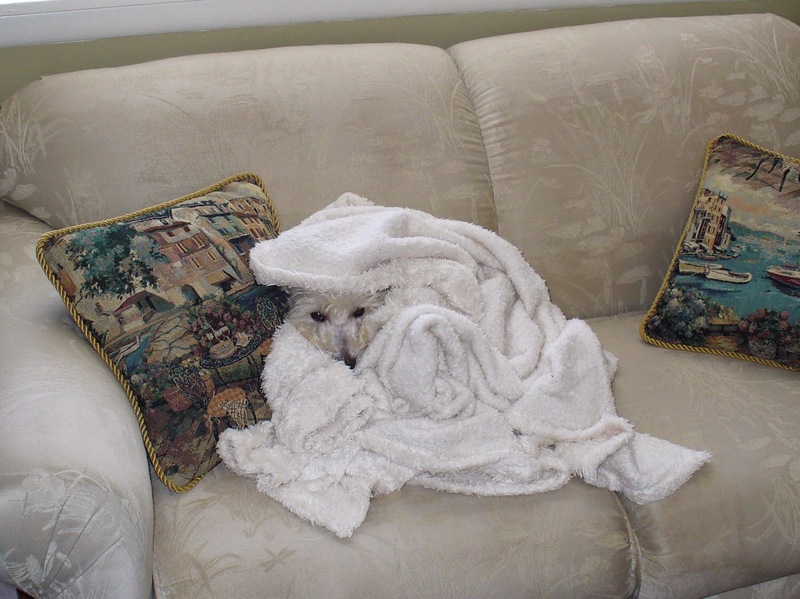 I gathered my dog on the bed (I only had George at the time) and settled in under a layer of of my mother's quilts, waiting for morning to come. When I awoke, daylight showed exactly what destruction had occurred in the night. The thermostat in the house read 56 degrees F (13 C), and as I looked outside, all I could see was tree limbs. Every tree in the yard had taken severe blows from the ice, sending many of their branches crashing to the ground. The entire neighborhood was covered in broken branches. One of two Bradford pear trees that were hit hard by the storm, this, by far, the worst of the two. The cedar tree behind it was largely undamaged, only sagging from the weight of the ice. My Bradford pear tree, still fairly young and small, took the most severe damage, breaking completely at the trunk about four feet high. The entire top portion of the tree snapped and was laying to the side. All that was left was a stump, four feet high with nary a branch or sprig or leaf left attached to it. longer. Just right of center, you can see the sad remaining stump of the pear tree. We spent the next several days cleaning up, removing the remnants, and burning the debris. I placed "stump removal" on my list of things to do when spring arrived, but I never got around to it. 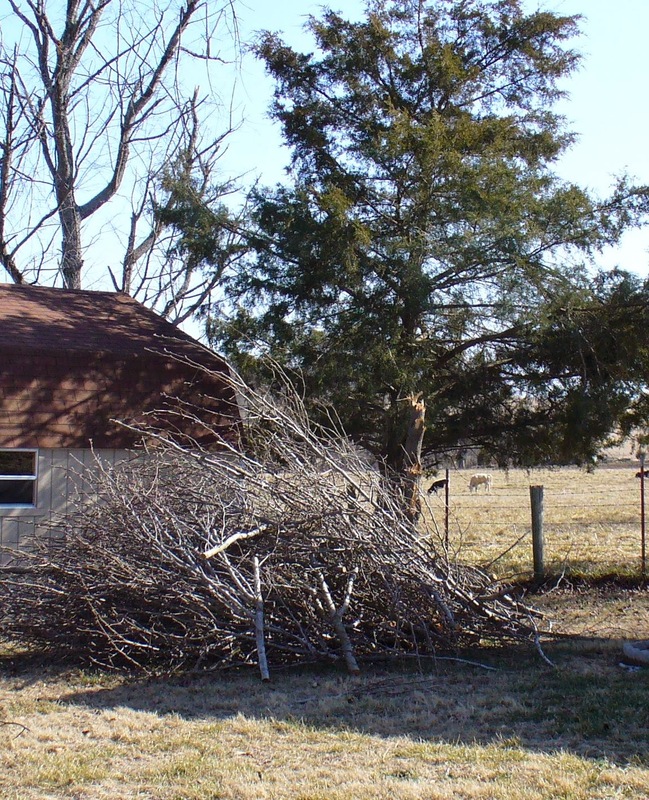 That four-foot stump stood there as a testament to the ice storm for another year. The following spring, however, an amazing thing happened: it sprouted. A few green sprigs of life burst from that stump, once thought dead. I decided to watch and see what happened. That summer, it grew like wildfire. Within two years of the storm that ripped it to shreds, the tree was back as large as it ever was. But one thing was missing. It no longer flowered in the spring. I was so happy to have the tree back, I did not care about the lack of spring flowering, though it is my favorite stage for this variety. I loved watching the end stages of flowering when a late spring wind would send the tiny white petals into the air in a soft flutter. It may no longer flower, but it is big and green and lovely with the shade it provides. I would be happy with it, no matter what might be missing. Last year, a full five years after its devastating injury, it flowered again. Fully recovered and joyously celebrating, it put forth a full crisp white display of blooms that seemed to burst onto it's branches overnight. So full of flowering buds it was that the white petals outnumbered the green leaves, and a gentle breeze sent the soft rain of white petals into the air for weeks. It was as though the tree had saved up all its energy for those quiet five years of restoration only to break open and pour its loveliness out into the world in one burst of celebration. It had recovered, from unbelievable devastation, to become its most glorious self. After five years, it flowered again, and even more beautifully than before. As heartbreaking as it was to witness, I think the tree had to go through this devastation. It had to prove its strength, its willingness to, quite literally, be knocked to the ground and by sheer will, dare to keep going. Through that strength, that immeasurable determination to keep trying again and again and again, it not only flowered again, but it flowered more beautifully than ever before, a beauty now enhanced by its story. Its beautiful bursting forth was preceded by unmerciful chaos, a story that only makes the reemergence of its spring flowering that much sweeter. Very lovely. I know the ice-storm-ruined-tree picture well, from 2001. It's the story of the sprouting seed that caught my attention, though. I am one. I, as you told, have some growth to do, some messy to endure with gritted teeth and blushing cheek. It is absolutely necessary or I would not. Grr. Thanks for the picture. I love seeds, the power in them and the potential. That thought just might get me through.